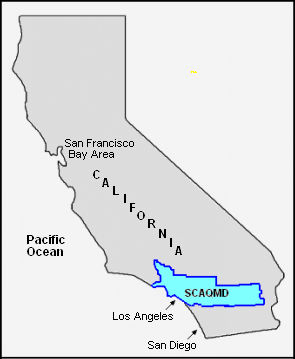 Location of the SCAQMD within the state of California. The South Coast Air Quality Management District (SCAQMD), formed in 1976, is the local governmental agency in California responsible mainly for regulating stationary sources of air pollution in all of Orange county and the urban portions of Los Angeles, Riverside and San Bernardino counties. The main office of the SCAQMD is located in the city of Diamond Bar, California. The area encompassed by the SCAQMD amounts to about 10,750 square miles (27,840 square kilometres) and is the second most populated area in the United States. This area has a severe problem with smog and the SCAQMD has been a leader in the nation's efforts to reduce air pollution emissions. The SCAQMD develops, adopts and implements an "Air Quality Management Plan" for bringing the area into compliance with the clean air standards established by national and state governmental legislation. Air quality and permissible air pollution emission "rules" are promulgated to reduce emissions from various sources, including specific types of equipment, industrial processes, paints, solvents and certain consumer products. Permits to operate (in compliance with the air quality and emission rules} are issued to the pertinent industries and businesses and SCAQMD staff conducts periodic inspections to ensure such compliance. The SCAQMD's rules apply to businesses ranging from large petroleum refineries and power plants to gasoline fueling stations and dry cleaning plants. There are about 30,000 such businesses operating under SCAQMD permits. In general, the SCAQMD is limited to establishing rules for regulating stationary sources. Emission standards for mobile sources (automobiles, trucks, buses, railroads, airplanes and marine vessels) are established the U.S. Environmental Protection Agency and the California Air Resources Board. The SCAQMD also operates an extensive network of air quality monitoring stations (about 40 stations) and issues daily air quality forecasts. The forecasts are made available to the public through newspapers, television, radio, faxed messages to schools, the SCAQMD's internet website, and a toll-free smog update telephone line. About 70% of AQMD’s funding is derived from fees paid by the regulated businesses, 20% from motor vehicle registration fees and the balance from other sources such as fines and other penalties assessed for businesses that violate the AQMD's rules. This page was last modified 23:32, 31 January 2012.